StencilQuik BGA Stencils Benefits | BEST Inc.
StencilQuik™ allows you to rework a BGA even in tight spaces not accommodated with a metal stencil. StencilQuik™ eliminates the hassle of cleaning stencils. StencilQuik™ eliminates hours of tedious mask repairs underneath BGAs. StencilQuik™ eliminates multiple paste print operations due to dirty stencils. Eliminate hours of solder mask damage repair time for BGA sites while improving rework yield. StencilQuik™ allows you to rework area array devices on warped boards as the stencil is held in intimate contact with the PCB when the solder paste or flux is applied. 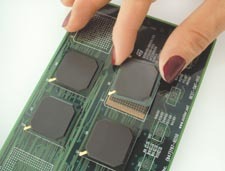 Simplifies BGA placement as you can "feel" the device settle into the apertures of the StencilQuik™. StencilQuik™ Patent Pending, BEST Inc.